Vasconcelos, J.T. and M.L. Galyean. 2007. Nutritional Recommendations of Feedlots Consulting Nutritionists: The 2007 Texas Tech University Survey. J Anim Sci. 85:2772-2781. A survey conducted by Texas Tech University collected information from 29 consulting nutritionists on nutritional recommendations for feedlot cattle. Previous surveys conducted suggested that a common source of nutrient requirements for beef cattle is the National Research Council (NRC) and common feeding practices generally fall within one to two times the recommended guidelines. The current survey aims to update previous data on beef cattle feedlot nutrition programs to aid in future NRC recommendations. This survey collected data divided into sections covering general information about the nutritionist’s practice, commodity information, use of grain coproducts, use of roughage sources, finishing diet adaptation, supplements and micronutrients, feed mixers, feed mills, feeding management, cattle management, liquid feeds, feed formulation, and information sources for nutritional recommendations. 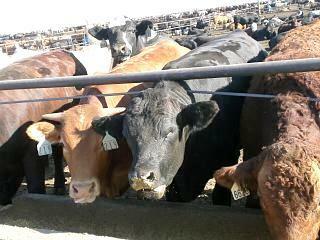 In line with previous studies, the average finishing diet for feedlot cattle consists of 70-85% grains. Corn is the primary grain source for these rations, with secondary grain sources of barley, sorghum, and wheat. In recent years, there has been a sharp increase in the amount of grain coproducts used by feedlot consulting nutritionists because of its increased availability and relative nutrient value. Common grain coproducts used include wet distiller’s grains, wet and dry corn gluten feed, and wheat middlings. According to the current survey, grain coproducts are used by an average of 82% of feedlot clients at an average of 16.5% of the diet. In order to meet the high net energy requirements for gain (NEg), nutritionists include this high proportion of grains in the diet of finishing feedlot cattle. The average NEg content of finishing diets for those nutritionists surveyed was 1.50 Mcal/kg, but ranged from 1.37 to 1.70. Grain processing is important in feedlot diets to increase the availability of starch, the main source of energy in grains. The survey concluded that steam-flaking is the most common method used (65.5% of responses), although other methods are used including dry-rolling, high-moisture harvesting and storage, reconstitution, or a combination of the four. Nutritionists can use a number of methods to measure the availability of starch in processed grains; which is important to verify consistency of product from day to day. Five methods commonly used to measure starch availability include enzymatic processes, gas production, gelatinization, flake color index, KSU refractometer, or a combination of these. The amount of starch availability for these processes averages between 56 and 60%. Adapting cattle to the finishing diet is important in preventing digestive problems and maximizing intake; to accomplish this many feedlot-feeding programs include multiple step-up diets and/or two-ration blending programs; 75.9 and 13.8% of responses, respectively. According to the survey, for multiple step-up diet programs, 3 diets are used in programs with cattle on each diet for an average of 7.2 days. Two-ration blending programs generally allow 21 days for cattle to adapt to the finishing diet. For both programs, the initial level of roughage in the diet averaged 40% for responses in this survey. Inclusion of roughages in the starting diet allows feedlot cattle to adapt to the grain based diet and potentially promotes performance and health of the cattle during the adaptation period. According to this survey, corn silage is the most commonly used roughage in feedlot diets followed by alfalfa, sorghum silage, cottonseed hulls, cotton burrs, and sudangrass hay. The current survey collected data on other feeding and milling practices for feedlot consulting nutritionists. The survey found that most clients use some form of supplements and microingredients to complete a balanced ration. These ingredients are in the form of liquid, pelleted dry, loose dry, or microingredient supplements. Most clients use horizontal mixers for feedlot rations, but stationary mixer/delivery trucks, truck-mounted mixers, and vertical mixers are also used. Most clients reported using flat storage or tuck mixers for milling practices and batch systems, and continuous-flow systems were also mentioned. According to this survey most all clients feed cattle 2 or 3 times daily. Most minerals supplemented in the feedlot finishing rations are fed at a level with 2-times the amount recommended by NRC. Likely this is from nutritionists erring on the side of excess instead of limitations. This survey found that many consulting nutritionists did not formulate rations to degradable intake protein (DIP), showing a possible caution when applying laboratory methods in the field. Overall, the responses to the survey were reasonably without variation, leading to the assumption that this data set is a fair representation of a large portion of nutrition programs for the feedlot industry. Previous They have a class for that?